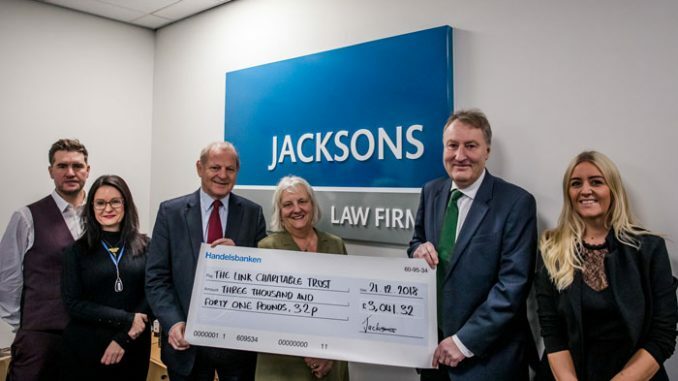 Jacksons Law Firm has handed over a cheque for £3,000 to Redcar-based charity The Link Charitable Trust after a year of fundraising activities organised by the firm’s charity committee. All members of staff at the Stockton law firm took part in a number of events during the year, including dress down days, a pumpkin carving competition, quiz night, raffles and a golf day in order to raise awareness for the charity. The charity’s chair Ian Swales said: “The staff at Jacksons have given us fantastic support this year. Stephen Wiles, partner and head of corporate recovery at Jacksons said, “Every year our staff are invited to put charities forward and whichever has the popular vote, becomes our charity for that year. “We would love to support all of the charities, as each and every one of them are a great cause in their own right. “We were delighted to support The Link Charitable Trust this year and have had a lot of fun raising awareness of the great work they are doing. The Link is a Community Interest Company (CIC), established in 2010 when founder and managing director Tina Jackson identified a gap for supporting children and young adults with mental health issues. The charity provides therapeutic services to children, young people and families across the North East including Teesside and the boroughs of Redcar and Cleveland, Middlesbrough, Hartlepool, Stockton and Darlington. Their services include a wide range of emotional resilience workshops and training, therapeutic assessments, one to one therapeutic intervention, including specialist therapies.